Mayan civilization thrived for six centuries during which time they understood the value of balance in good health. Through their holistic practices Mayan healers sought to imbalances through the regenerative potential of plants and herbs. 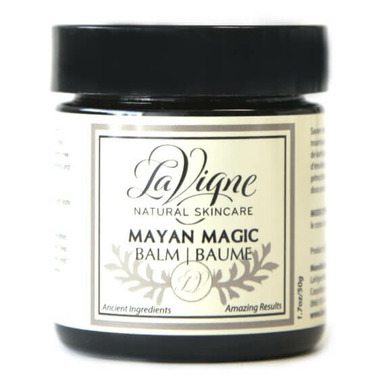 Mayan Magic Balm contains 20% Tepezcohuite, an ancient, indigenous tree extract, responsibly sourced from Mexico. Shea Butter, Tepezcohuite and Vegetable Based Emollients work together to nourish and comfort dry, damaged skin. Directions: Apply to face and body as desired. Avoid direct contact with eyes and delicate areas. Aqua, Mimosa Tenuiflora (Tepezcohuite) Bark Extract, Butyrospermum Parkii (Shea) Fruit Butter, Arachidyl Alcohol (and) Behenyl Alcohol (and) Arachidyl Glucoside, Glyceryl Caprylate (and) Glyceryl Undecylenate. * Older versions of this product label may list the Arachidyl Alcohol (and) Behenyl Alcohol (and) Arachidyl Glucoside as its common name, “Vegetable Emulsifying Wax“. Whether it is listed as the three separate ingredients or the common name, it is the same ingredient. There were also a limited number of batches produced with Organic Aloe Gel, which will have the Aloe listed as the first ingredient. Ingredients: Aqua, Mimosa Tenuiflora (Tepezcohuite) Bark Extract, Butyrospermum Parkii (Shea) Fruit Butter, Arachidyl Alcohol (and) Behenyl Alcohol (and) Arachidyl Glucoside, Glyceryl Caprylate (and) Glyceryl Undecylenate. Wonderful product. I use it daily to reduce itchy spots on my body. I will continue to use it. I bought this product hoping it would help the rosacea on my forehead - I gave it a couple of weeks but it didn't help at all. I read about Tepezcohuite but I feel this product doesn't have enough of the tepezcohuite in it. Maybe it will work for something else. Worked well. Would order again. This helps soothe my itchy skin on my elbows and I like how it has natural ingredients. Definitely a great product especially for winter. When I get red rashes from allergies/cosmetics, I apply the Mayan Magic and the itchiness goes away immediately. The redness goes after about 20-30 minutes. It is magical but won't help with everything. I tried it on a bee bite and it did nothing. I would definitely buy again. The product name says it all. It's magic! Works on everything and is a wonderful product. OMG!!!!!!!! This product is unreal! It's Magic in Jar! For someone like me who has tried just about everything, and this product. What a wonder. But, Well you NEED TO GET THE BIGGER JAR!!!! PLEASE. THEY MAKE IT. (from the actual company site, and they charge for shipping too)!!! and they do have more Products that I think would do at WELL.CA.